Nick Piunti's name has become synonymous with the finest in melody-driven guitar pop. With that in mind, you know exactly what to expect from his latest effort. 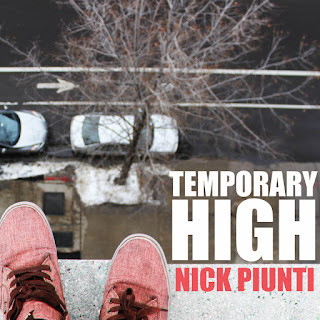 Out today, Temporary High is Piunti's fourth album in six years (and his second on Marty Scott's Jem Records). It's absolutely the kind of record we've come to expect from Piunti - grounded in gorgeous melodies and smart, thoughtful lyrics. Again Piunti has worked with Andy Reed & Donny Brown as his rhythm section and Geoff Michael as his co-producer. Another frequent collaborator, Ryan Allen, co-wrote two of the tracks. This album definitely applies the principle of not fixing what isn't broken, and I applaud that fully! In typical Piunti fashion, Temporary High doesn't leave you waiting long for the "hit". The title track is in the lead-off position, and it's vintage Piunti power pop/alternative/dad rock goodness right down to the punchy guitars and stick-in-your head chorus. And I love the coupling of immensely pleasing melodies and serious, hard-to-swallow lyrics. We can probably all think of someone we know that resembles the lyric "Last in the line but first with your hands out", but Piunti shows a deft touch in building from tough love to genuine sympathy. Elsewhere, Piunti runs the gamut of crunchy, mid-tempo power pop ("You're Perfect and I'm Not"), ultra-mellow alt-rock/pop ("Deep Freeze"), upbeat jangly pop ("No Return"), and pure singer/songwriter fare ("If This Was Right", co-written with Allen). The common thread across the album's ten tracks are stellar hooks, silky smooth harmonies, and melodies you're bound to find yourself whistling all day. And while this album has its share of songs exploring the doomed/ill-fated side of romantic relationships, what strikes me is how many of these songs take the brighter view of love. You'd perhaps expect sarcasm from a song titled "You're Perfect and I'm Not"; instead the sentiment is genuinely sweet. Finally an anthem for all of us married men who never forget how lucky we are! And how great of a line is "You stood by this wreck of a train passing by"! Similarly, "No Return" and "Contagious" are tributes to enduring adult love, crafted with humor and eloquence. It's always an immense pleasure to come across a new record from Nick Piunti. I am not adverse to the idea of Piunti trying new things (check out the drum machines and keyboards on "Headphones"). But ultimately, I know he's never straying too far from the tuneful pop craft he's mastered. He's just so good at what he does, and the quality and consistency of his songwriting is the same with every new album. He continually writes songs about meaningful things and delivers them with indelible melodies. Four albums in six years certainly qualifies as a creative roll. I can only hope he stays on it for many more years and albums to come! Ravagers - "Drowning In Blood"
An Interview with Rich Ragany! Geoff Palmer - "Got The Skinny"